Today I head up a big meeting that I have to do quarterly and I realize I usually wear 1. a dress and 2. something sparkly when I want to look my best. I thought this would be a perfect time to test out my latest Shop Suey Society piece, the Anne necklace. Unfortunately, the Anne has been selling out like crazy but the Vickie is like her more color sister and Ariel is like her more eclectic sister. I love the sparkle and shine, it’s really beautiful in person. It makes me smile with all the sparkle. I decided to wear some bold color today for my meeting. You’ve previously seen me in this lovely orange faux wrap dress from Target. When I was reading the blog Making it Lovely, she mentioned a similar shaped dressed but in longer sleevesand I immediately scooped it up. 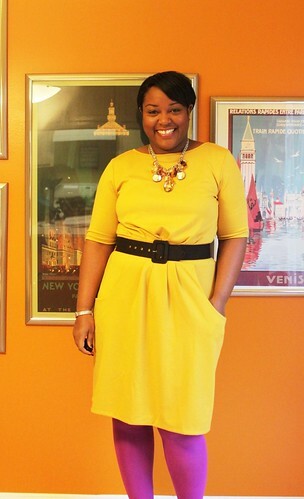 For $29 at Target I figured why not add another dress to my fall wardrobe in a citrus shade. I had intentions of wearing this dress with deep teal tights but when I got up this morning I had pink and yellow on the brain, so vividly bright pink tights it was! I also thought they’d pair really well with these super cute two toned oxford heels I bought at TJ Maxx the other day for $40 (which is still less than their current sale price at Nine West. 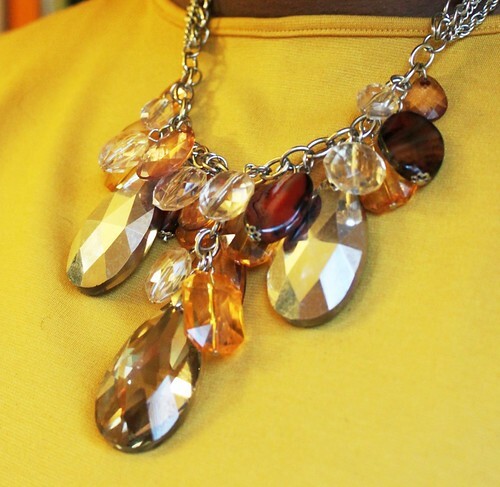 The entire outfit really is a budget bargain of colorful goodness – LOVE IT! I’m super comfortable, super bright and super happy with today’s look. And don’t forget that if you go to Shop Suey Boutique and use the code Art20 you’ll get 20% off any regular priced items – YAY! And definitely look out for Anne again, she’s gorgeous. This is such a great outfit! I love the necklace too. It’s amazing! LOVE that color. I want that outfit!! I’m wearing that dress today too! I love the ease of the Target knit collection, and the pockets are fantastic. I love it! I’m so glad Nicole replied to your tweet so I found your site! Hooray! 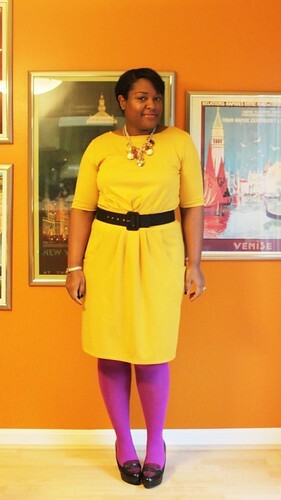 Girl, you ROCK colored tights, looks fab! And I just ordered that dress in orange last week – should be getting any day now!